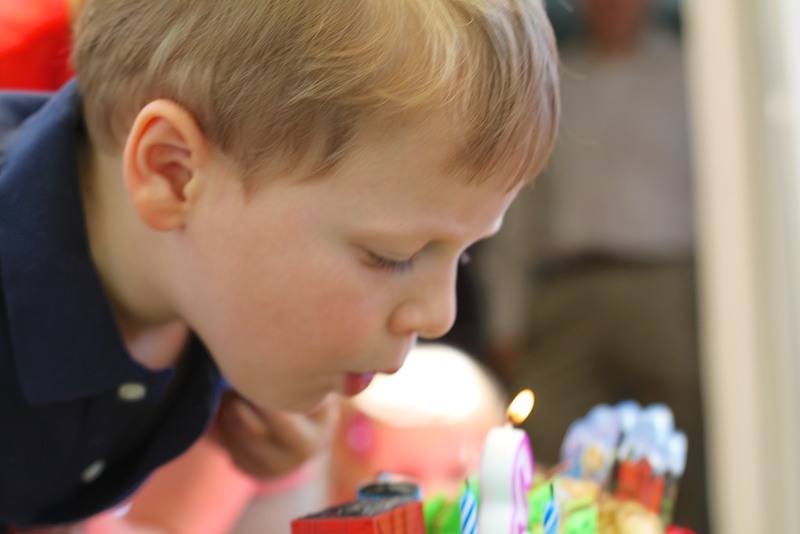 I captured the moment that defined my son’s third birthday. But there were 43 more seconds of video action I was hoping someone in the crowd would get. The next gauntlet would be to convert the video from QuickTime to Windows Media. More cake, anyone? My boy just had his third birthday party. And the best part was… he understood what it was all about! And as if experiencing all these wonderful moments at yesterday’s party wasn’t enough, I also wanted to capture some of them for posterity. You know. A few pictures. A couple videos. I don’t know why the ‘Happy Birthday’ song is such an iconic moment at birthday parties. If you miss it, it’s like the whole shebang didn’t even happen. So I was eager to ensure I got my preschooler’s birthday-song moment on video. My wife and I had a couple ringers (other parents) in the crowd to help us capture the moment. I would be right next to my boy and technically part of the action. So I held onto the DSLR to take a couple quick candle-blowing close ups and relied on the two pocket cameras to do the heavy lifting for the video assignment. If You Don’t Have the Video, Did the Birthday Party Happen? I didn’t need two separate camera angles, but I wanted a back up plan if one of the cameras or volunteer camera operators ran into trouble. One of the two pocket cams switched hands at the last minute. or some such understandable redirection of parental resources. Then, apparently my video directive became diluted, and the substitute videographer shot a couple of photos instead of video. And the fate of the other camera operator? Fortunately, he came through with flying colors. (not that I had any real doubts… I had hand-picked this parent. He had previously demonstrated the innate flexibility of a documentary cinematographer at other Lester events. Again, I don’t understand why the birthday song is such a ‘must capture’ moment, or why I’ve become so focused on it. Maybe, it so effectively summaries the entire event, like a newspaper headline. Plus, the whole candle blowing ritual has turned into a kind of sport for children. Before we had even said goodbye to all our guests, the first video came in via a friend’s iPhone. That ease of sharing via smartphones almost defies linear time! If you can practice your video sharing via smartphone voodoo, I highly recommend it, as long as your video snippets are short. Another way to share your home videos is to simply upload them to a streaming-friendly website like YouTube, Vimeo, or Facebook. Yes, you’ve shared your life’s precious moments via a streaming solution, but you haven’t truly ‘given’ them to anyone yet. Let’s just say today’s task is to simply get the birthday-song video to Grandma. If you want Grandma to always have access to the video, she’ll have to download your file to her computer’s hard drive. First, download your two-minute HD movie from your digital camera to your Apple computer. It’s a hulking 200 MB file. These days, most cameras natively create their video files in the QuickTime format. (So you’ll need a way to convert it to a Windows Media file. If you want to retain the full HD quality of your video, you’ll have to use a file sharing service like Dropbox or YouSendIt. Once you upload your video, you’ll receive a downloadable web link to share. If Grandma can handle the several steps to the download and save process, that’s clearly the way to go. Email the file to her. Your next challenge is to compress your video before emailing it out. I recommend using Apple’s ‘Compressor’ or QuickTime to reduce the video frame’s size and the frame rate. Now, it’s time to convert your movie to a Windows Media file. Can you cook up a Windows Media file with the QuickTime player? Has someone else figured out a fix? The solution I use is Flip4Mac. It’s a product from Telestream that easily converts your MOVs into WMVs. The free Flip4Mac Player version simply lets you play WMVs on a Mac. If you want to convert WMVs to MOVs, you’ll need the $29 Player Pro version. But you want to go the other way. That trick will set you back $49. It’s called the ‘Studio’ version. $49 to convert your movie to a WMV for Grandma? Believe me, this software will not have a one-time use. So I took my boy’s 140.8 MB Happy Birthday moment, which runs 44 seconds, and decided to email it to my mother-in-law who does, in fact, require a WMV version. For those in the know, video compression is a fine art. This simple compression reduced the data rate and quickly dropped my frame size from 1280 x 720 pixels down to 640 x 360 pixels. More importantly, it reduced my MOV file from 140.8 MB to a manageable 13.7MB. Then I converted the MOV into a 320 x 180 pixel WMV via the Flip4Mac integration with QuickTime. I created an easy-to-digest 4.6 MB file to email Grandma. Yes, the frame size is really tiny, but otherwise it looked and sounded reasonably good! I’ve used Flip4Mac for awhile now-the best solution out there for those pesky WMV conversions from QT files. The other great thing is how easily it works within FCP (v7 at least! Don’t know about X!) and works great with Compressor as well – many a Microsoft video case study edit I did in FCP7 that then had to be converted from Apple ProRes to WMV, then sent to Microsoft. And don’t even get me started about Microsoft’s 10-page instructions on how they wanted each edit archived! LOL! 10 pages to archive? That sounds complicated! !